The Alabama Crimson Tide may be coming off a national title win, but they won't be dominating the ticket box office in the SEC this season. The Tide, who top the AP Poll heading into Week 2, actually serve as the third most expensive SEC team on the secondary market in 2016. It is Georgia who owns the top-priced ticket in the conference - and by a significant margin. Coming off a Week 1 win over North Carolina in the annual Chick-fil-A Kickoff Classic, Georgia heads to Sanford Stadium to play its home opener against Nicholls State this Saturday. The Bulldogs own the No. 9 spot on the AP Top 25, but they'll lead the way in the SEC in terms of ticket prices on the resale market. 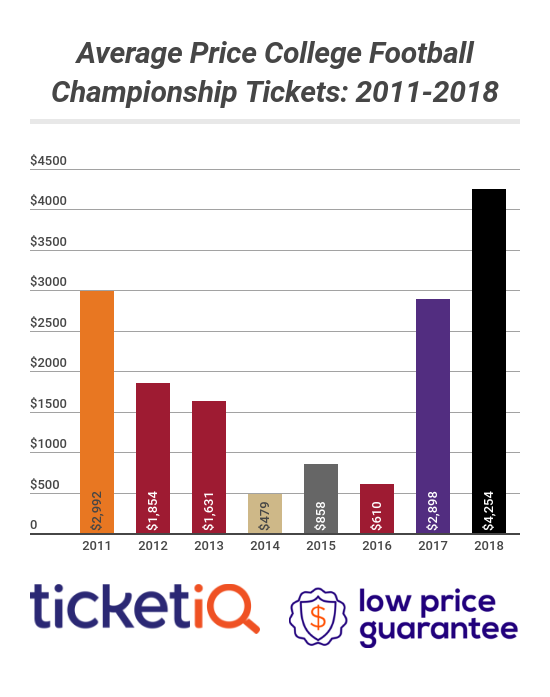 The average price for Georgia tickets on TicketIQ is now $235, nearly 37% higher on average than Ole Miss, who possesses the second highest tickets in the conference this season. Blame a loaded home schedule for the big prices in Athens. Tennessee and Auburn are both scheduled to play Georgia at Sanford Stadium, and each game currently owns an average resale price above $300. This Saturday's game against Nicholls State will be the cheapest game of the season, with tickets averaging $68 and the get-in price listed from just $15. Mississippi buckled at a third-quarter rally from Florida State in Week 1, failing to respond to a 23-point blow issued by the Seminoles and ultimately losing, 45-34. Still, despite an eight-spot drop in the AP Poll, the Rebels still have the second priciest tickets in the SEC in 2016. Ole Miss tickets during the 2016 season now average $172 at Vaught Hemingway Stadium. Like that of Georgia, Ole Miss' schedule at home also showcases several marquee matchups. Alabama, Georgia, Mississippi State and Auburn will each travel to Oxford this season, and each game is posting a notable premium over Ole Miss' season average. The September 17 game against Alabama is the most expensive of the season with a $337 average and $170 get-in price. Conversely, this Saturday's game against Wofford is the cheapest at a $35 average and just an $8 get-in price. National championships don't necessarily lead to exorbitant ticket prices, and Alabama is proving just that in 2016. Alabama tickets at Bryant-Denny Stadium this season are averaging $162, good enough for third highest in the SEC. That marks a 16% jump on average from last season, when tickets averaged $140 across all games in Tuscaloosa. The Tide's most expensive home game comes on November 26 in the Iron Bowl game against Auburn. The current average resale price is $450 and the cheapest available ticket is listed from $244. On the opposite end of the financial spectrum is this Saturday's game against Western Kentucky, where tickets average $60 and the get-in price is just $22. The Aggies kicked their season off with a win over UCLA last Saturday, jumping into the Top 20 on the AP Poll. The team owns the fourth most expensive tickets in the SEC this season, with Texas A&M tickets at Kyle Field averaging $155 across all remaining games. Tennessee travels to College Station on October 8 for what will be the most expensive game on Texas A&M's schedule this season. Tickets currently own a $247 average and $131 get-in price. On Saturday, the Aggies welcome Prairie View A&M in their least expensive game, with tickets averaging just $51 and the cheapest listed from $10. Rounding out the top five most expensive SEC teams this season is Auburn, who dropped their home opener to Clemson last weekend. The Tigers have seven games remaining at Jordan-Hare Stadium, and over that time Auburn tickets currently average $135 on TicketIQ. A September 24 meeting with LSU is the most expensive of the season, with tickets averaging $217 and the get-in price listed at $82. The Tigers' Week 2 game against North Florida is their cheapest at an average resale price of $44 and a $6 get-in price.